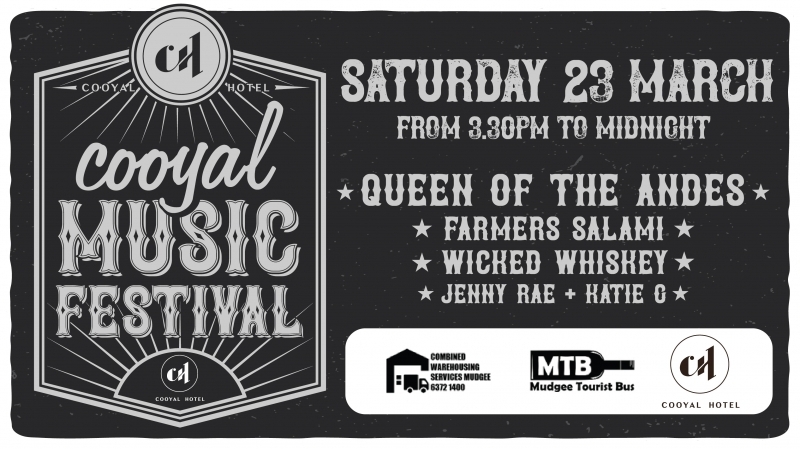 Cooyal Hotel is hosting the inagural COOYAL MUSIC FESTIVAL, featuring local artists: Jenny Rae & Katie G; Wicked Whiskey; Farmers Salami; and Queen of the Andes. Event runs from 3.30pm to midnight. Food available. Free camping available. Bus transfers from Mudgee or Gulgong available. Cooyal Hotel is a licensed premises. All laws regarding the sale and consumption of alcohol strictly apply. Persons under the age of 18 must not consume alcohol on this premises. Patrons may not bring alcoholic beverages or food onto the licensed premises. All drinks and food will be sold at the venue. Camping is permitted only in a specific zone on the property. Camping outside this zone is not permitted. Bus transfers to and from Mudgee or Gulgong are pre-booked only. It is the responsibility of the ticket holder to be on time for the bus. For Mudgee, buses will depart from the Tourist Information Centre and the Coles Bus Stop at 3.00pm. For Gulgong, bus departure location will be advised. The return bus departs from Cooyal Hotel for Mudgee or Gulgong at midnight. Tickets are non-refundable. Upon arrival at Cooyal Hotel, ticket holders will be issued with a wrist band. This wrist band must be worn at all times during the event. Persons without a wrist band will be ejected from the venue.